Steven (Chicagoland, United States) on 26 October 2011 in Landscape & Rural and Portfolio. 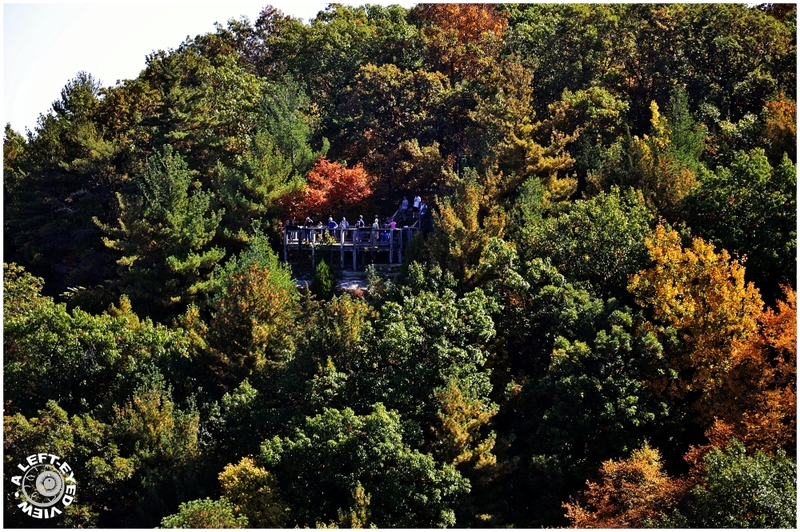 View of park patrons at the Lover's Leap Overlook from our location at Starved Rock in Starved Rock State Park in Oglesby, Illinois. Photo captured October 9, 2011. So... green and intricated. An ideal place for romance. Gorgeous colors and foliage. I've not been to Starved Rock park since my childhood. in the middle of the trees! great capture! Beautiful fall colours and wonderful light. Beautiful vantage point and I like your point of view looking across to the group of park patrons. Wow, what a great overlook shot - the park did well to perserve the area around the overlook. Excellent Steven! Nestled in the beauty of Autumn; a very fine shot. A superb composition and great colors ! I agree with Curly - looks like they are engulfed in the forest ;-) .... beautiful! Cool shot of all the lovers over there. ;-) Some nice colors are beginning to show. Beautiful. It looks like they are way up in the trees. Amazing image! What a beautiful place to stand - and where they must have a nice view from there!